Last weekend saw the Dartmouth women travel to Camden for the Eastern Sprints, with a potential NCAA spot on the line, and the heavyweights face Syracuse in the last dual race of the season. Race recaps are below. There’s no racing for the Dartmouth crews this weekend, but the HEAVYWEIGHTS and WOMEN will have fingers crossed for IRA and NCAA selection news. An update on that will come as soon as it’s available. 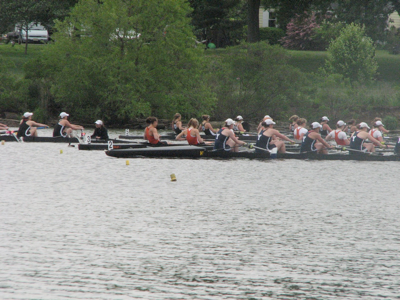 The LIGHTWEIGHTS concluded their season at the Eastern Sprints. In Worcester, a good Dartmouth crew raced competitively with several other good crews and a couple of great ones. Last weekend in Syracuse, we were just average, and the results reflected as much. The varsity, second varsity, and third varsity were unable to match Syracuse’s speed in increasingly heavy conditions, and the frosh were on the wrong end of a three-second outcome in the day’s closest and roughest racing. Several factors contributed to the performance, and while none of them will change Sunday’s outcome, they’re worth mentioning. I could be accused of training the crews through their last dual race of the season, and I did so with a purpose: with selections coming out later this week, I’m confident that the varsity and freshmen will be selected to race at the IRA, and optimistic that the second varsity may be included, too. The three weeks between Sprints and the IRA represent an excellent opportunity to train hard and gain some late-season fitness. While we’re at it, a quick explanation on the changes to this year’s IRA, slated for June 4-6 in Sacramento. In the past, the regatta has been more of an all-comers affair than a true invitational, and it has featured fours and pairs in addition to the four eights (varsity, second varsity, frosh, and lightweight). This year, only the top 24 of the 81 Division I, II, and III varsity men’s programs in the country will gain entry through a series of automatic qualification regattas, like the Eastern Sprints, Pac-10, ECAC, Dad Vails, and WIRA, and at-large bids. Schools that bring a varsity eight will be eligible to bring a second varsity and frosh eight, provided those crews meet certain qualifications standards. And while there’s a fours race for spares, the other small boats have been eliminated. Finally, the location is a concession to the west coast crews who have traveled east throughout the regatta’s existence. It's tough to focus right now. We are awaiting the NCAA Selection announcement that airs via webcast at 5pm this evening. If you're at a computer then, go to:http://www.ncaa.com/sports/c-rowing/ncaa-c-rowing-body.htmland watch with us. Sunday was a good day for our team. Our primary goal was to qualify all crews for the grand finals, and then race with reckless abandon in the afternoon. All but the 3VB four (who had a tough heat and moved on to petites) advanced in the top six. The 1V was nervous in the morning. The memory of being edged out last year still hung in the air. We also made a lineup change that week. We were confident that we'd finish 5th with the lineup we raced all season, but we knew a distant fifth would be just outside of NCAA contention. Through meticulous testing we found a faster combination, but it's tough to be 100% confident in a lineup that is not battle-tested. There was a noticeable sigh of relief from all crews after the heats, and everyone came back to the course relaxed and just plain excited to race in the afternoon. It was empowering to have five of our six boats make the grand final. The varsity A4 race was the most exciting and unexpected success of the morning heats. They came in ranked 9th, but walked through #3 Princeton and #4 Syracuse to win their heat. They came into brunch to have the whole team applauding and cheering - it showed how supportive the whole team is of our shared success. The 1st Varsity grand final was exhilarating to watch. They were in 4th place only to be edged out by Brown during the sprint, but still in a very tight margin behind the lead crews. The 2V raced aggressively to a respectable 5th place. The 3rd varsity 4 proved their morning win wasn't a fluke by beating Navy and coming in 5th as well. The novices also finished fifth. We expect them to make a big contribution to the team next year.